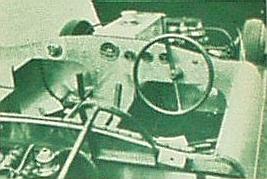 Technical novelties among sports race cars are usually found among the smallest engined models. 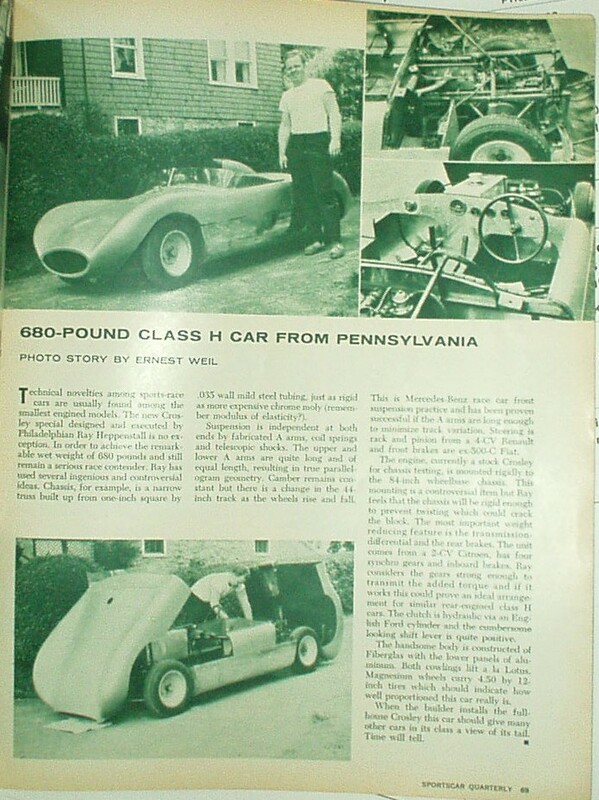 The new Crosley special designed and executed by Philadelphian Ray Heppenstall is no exception. In order to achieve the remarkable wet weight of 680 pounds and still remain a serious contender, Ray has used several ingenious and controversial ideas. Chassis, for example, is a narrow truss built up from one inch square by 0.035" wall mild steel tubing, just as rigid as more expensive chrome moly (remember modulus of elasticity?). Suspension is independant at both ends by fabricated A arms, coil springs and telescopic shocks. The upper and lower A arms are quite long and of equal length, resulting in true parallelogram geometry. Camber remains constant but there is a change in the 44 inch track as the wheels rise and fall. This is Mercedes-Benz race front suspension practice and has been proven successful if the A arms are long enough to minimize track variation. Steering is rack and pinion from a 4-CV Renault and front brakes are ex-300-C Fiat. 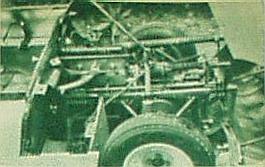 The engine, currently a stock Crosley for chassis testing, is mounted rigidly to the 84 inch wheelbase chassis. This mounting is a controversial item but Ray feels that the chassis will be rigid enough to prevent twisting which could crack the block. The most important weight reducing feature is the transmission- differential and the rear brakes. The unit comes from a 2_CV Citroen, has four synchro gears and inboard brakes. Ray considers the gears strong enough to transmit the added power and torque and if it works this could prove an ideal arrangement for similar rear-engined class H cars. The clutch is hydraulic via an English Ford cylinder and the cumbersome looking shift lever is quite positive. The handsome body is constructed of Fiberglass with the lower panels of aluminum. Both cowling fit a la Lotus. Magnesium wheels carry 4.50 by 12 inch tires which should indicate how well proportioned this car really is. 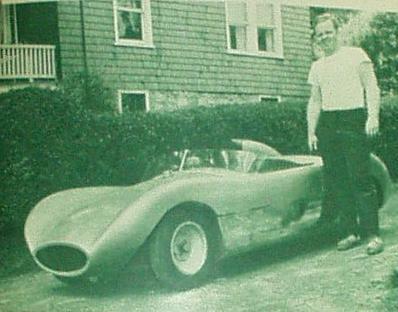 When the builder installs the full-house Crosley, this car should give many other cars in its class a view of its tail. Time will tell. 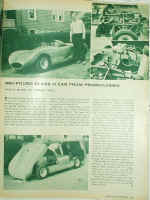 Thanks to Rich Campbell for providing the scan of this article.